Even at only 16 months Jack has amassed quite the collection of toys. 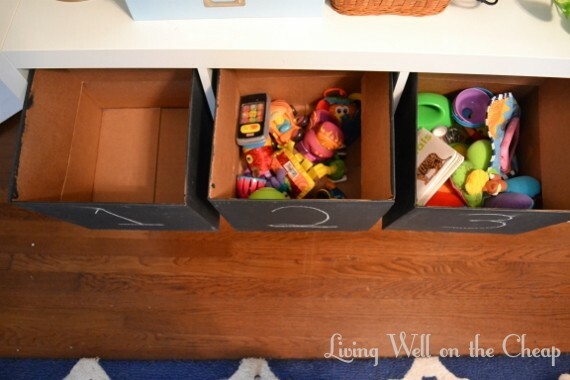 I’d heard of parents using a rotation system even before I was pregnant and always thought it sounded so smart but never saw a reason to implement it until recently, when Jack seemed to begin losing interest in the baskets full of toys scattered around the house. If we handed him something specific to play with he would engage, but I guess he was overwhelmed by the selection. So one night after he was in bed Nick and I dumped all the smaller toys into a pile and divided them into three boxes, trying to keep the composition roughly equal (ex: each box has at least one musical instrument, some bowls and cups, a book, a toy phone, a ball, etc.). Then we took the contents of box #1 and divided it between two baskets in the office and dining room and put the other two boxes up for storage. There are way more toys in each box than it looks like and we still have another empty box, so I think this system would definitely work even for a house with several kids. 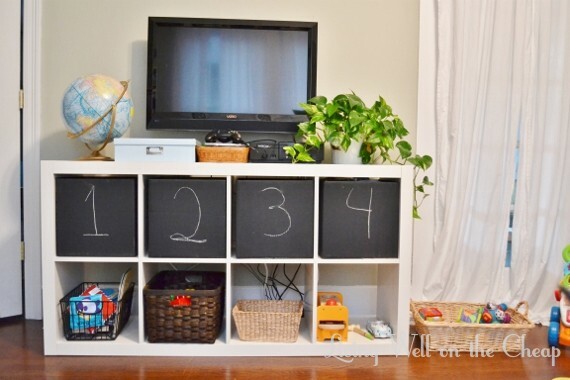 I just used the chalkboard painted boxes that I already had for the expedit storage system in our office/playroom. These used to be overwhelming bins full of toys on the bottom, but now they’re up top and the bottom row is reorganized to be a little more accessible to Jack. The three baskets hold books, mega blocks, and some smaller wood blocks, and the fourth cube holds a special toy that isn’t cut out for living in a basket. The shallow basket to the right hold some of the smaller toys that are in rotation. I really want to do something to panel the back both to hide all the wires and to prevent toys from slipping back there. Maybe beadboard? He got the play tent for his birthday from my friend Cassie but wasn’t into at first. I brought it back out and set it up the other day and he loves it. I’ll keep it out as long as it holds his interest, then put it away for a little while so it doesn’t get old. He’s also got his play table over there with an old laptop for him to pretend to work on. You can see here his basket of toys in the dining room. The playroom is on the other side of the house so this is a nice spot for him to play while I’m working in the kitchen (if he’s not getting into his favorite thing, the pots and pans). I used museum putty to secure some of the items on the shelves so they wouldn’t fall on him or get broken. 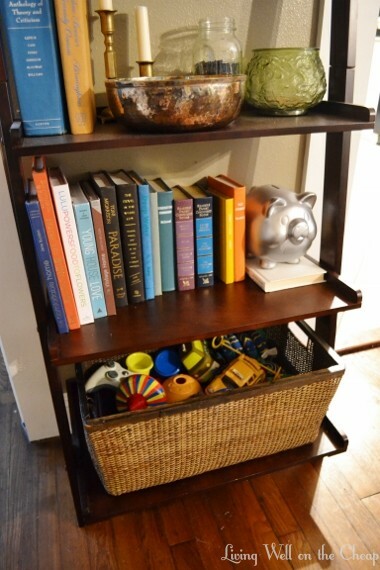 And of course he still has the Montessori-style shelves in his bedroom. 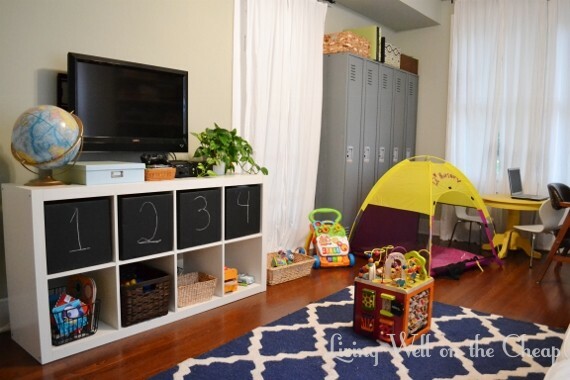 I am not one for having my house overrun by kids stuff so I think the key for both of us to be happy is to both limit the amount of toys that are available at any given time and to integrate their storage into the style of our home. He is so much more into his toys now that they aren’t all out all the time. When he gets tired of what’s available now I’ll rotate the boxes and it’ll be like a whole new collection of toys was delivered overnight! Do any of you with kids have any tips for storing and rotating toys? How about dealing with cranky toddlers? It looks like Jack is finally trying to drop to one nap a day and I’m so bummed. Ahhh, you are making me miss the days I could mess with toys and the kids were none the wiser. )) These days, if I remove something I swear I haven’t seen my 6-year-old play with in a YEAR, without fail the next week he’s asking where it went, haha. I set up a new system where I surreptitiously remove the unplayed with toys and put them in the basement toy box for a while. Then, if they’ve been sitting unplayed with in the basement for a while, I move them into a closet in the basement where I store things I plan on selling at the next biannual resale event in our area (covered up with a blanket, so the kids don’t know I plan on selling it.) Then I sell it at the resale event! My son still “busts” me once in a while when he asks for something that was taken out of his room a lo-o-o-ong time ago. Sometimes I say “Hmm, you’re right, I haven’t seen that around either” and change the subject. Other times I’ll do the right thing and confess, but try to convince him it was a “baby toy” and he didn’t want it anyway. I feel like such a bad mommy but what else can I do! There’s only so much space and so…many…toys! I am so not looking forward to those days! For when he gets older I’ve seen an idea where you have a Santa sack and the kids put toys in it that they want to give away and Santa comes and takes them away to give to other kids and then he leaves the new presents. So they learn about giving and you don’t just keep amassing things.